@Massimo, You can enable the “Autoplay” option in the settings (Settings -> WP Lightbox -> Library Settings -> PrettyPhoto Settings). Hi guys, great plugin, I love it! How can I set vimeo videos to autoplay? I’m using a shortcode to open the popup. @Nic, We don’t really provide options for ogv or webm because all major browsers now support mp4 format. This was necessary back then when HTML5 just came out. Besides this gives users less headache because they don’t need to keep track of three different video files for one video. WordPress only filters shortcode in the content area of a post/page. In order to filter shortcode in the header.php file you need to run it through the do_shortcode function (It’s a WordPress function). Other than that normal shortcodes should work fine. Hi, I wanted to add videos formats .ogv and .webm – does your plugin support this? I want to make sure I cover all browser formats. And just to confirm, I can add text to a wordpress page (backend page – I want to add a button link on the header.php page saying “click here to watch the video”) and have the video pop up as a lightbox. Many thanks for your help! @Cathy, Amazon S3 option is available in our paid version. Is this only for Vimeo and YouTube? What about amazon s3 in the paid version? Can I upload just a whole video file from my desktop or from Dropbox to have it play on my site through LightBox ultimate? Wanting to keep content secure as possible. Vimeo upload is poor quality. YouTube looks good but too easy to share. Trying to host paid training classes. Thx! @Jan, We do have a YouTube shortcode which allows you to pop up a playlist in lightbox with related videos turned off. Hello, please can you tell me if your WP LightBox Ultimate can switch off YouTube Related Videos at the end of any video? Basically I need youtube playlists support and related videos switched off . @elvia, It should be able to popup any page. You can see an example on our demo page. Can you confirm i can open html pages in the paid version? If i can not, would you guys be able to see why it doesnt work? @Bree, I believe you have the “Autoplay slideshow” option enabled in the prettyPhoto settings. Disabling it should fix the issue. The prettyPhoto video on my site loads and plays for a few seconds and then stops and plays from the beginning. Am I doing something wrong? Ok thanks, Developers it is. @Alan, Will you be actively using Lightbox Ultimate on each of those sites? If so you should get the developer option. In WP multisite even though you can activate the plugin from the parent site, each site actually has its own database. If I am using a WordPress multisite theme, will the standard WordPress Lightbox Ultimate Plugin be correct or will I need the developers? The theme is basically one site with multiple sub-domains. @mga, We have added this option to the prettyPhoto vimeo shortcode. Simply add loop=”1″ to the vimeo URL for the looping functionality. Having a looping function would be fantastic for those who do instructional videos. I use Vimeo only, by the way. @Jason, The plugin only supports pdf file at the moment. It’s also because browsers can’t really render doc or docx file. In order to open a file in lightbox the browser also needs to support it. Is there a way to create a popup word document which has anchor links embedded in the doc? I noticed that you can create a pdf popup but need to be able to have redirect links and and anchor links within the doc. @sam, Unfortunately .mov format is not supported in our plugin. The description of popular file types supported ends in etc. is .mov supported? I want to allow user uploads from the front end direct from mobile devices, so I am looking for something that supports .mov so that iOS devices are covered. Is it possible to embed responsive video that does not have the lightbox feature? Want to protect Amazon S3 video content but have the responsive video not pop out from the page. @David, There is an option in the settings to enable autoplay on videos. Unfortunately, We don’t have any option to automatically pop up the video when the page is rendered. Enjoying the free version. Need to have the video play automatically when the pop up box appears. Actually I want to share a link and when the link is clicked it goes to my site with the lightbox up and the video auto starting. Will the pro version do this? @reiner, The plugin only supports PDF format at the moment. is it possible to display a eBook (epub)? i am testing your free version of lightbox and it looks promising but, i only get a compressed portion of the website (i will be using this for a live stream IP address upload). what am i doing wrong? Yes text in the light box. Looks like it does. Does the pro version include this feature? @Paul, if you wish to play a YouTube playlist in lightbox you will need to use our advanced YouTube shortcode. Hi, I loved your Video Lightbox plugin. 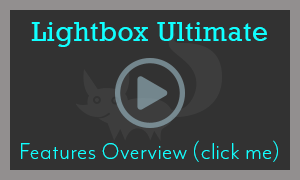 I purchased Lightbox Ultimate with the intention of using it for a YouTube playlist, however, I haven’t had success in getting it to display like the basic Video Lightbox plugin with automatic video thumbnail. Is it possible? And if so, could you send me the shortcode? @David, do you have the “Allow Image Expansion” option enabled in the “prettyPhoto” setings? When opening a popup window of lightbox it puts the words “close” and “expand” above their buttons. How can I remove theme ? @Paul, Lightbox Ultimate video opens in the middle of the screen by default. We don’t have any option to align it to the left or right at the moment. Can the videos be aligned left and right with ultimate video light box? @Keith, currently we don’t have any option to insert adsense code into the lightbox window. I am looking to purchase this plugin, I love free version, can I insert adsense code under the video that is playing in the pop-up window? @Kumar, unfortunately this feature is not available in our Lightbox Ultimate plugin. Is it possible to show post comments and “Comment form(Leave a Reply)” using this plugin? Please let us know. @Adam, yes you can. You should be able to host your MP4 video anywhere as long as the URL is accessible. Hi, can I use this plugin to pop up my self hosted MP4 Videos in lightbox? 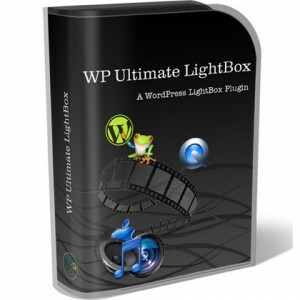 @Tahlia, Lightbox Ultimate is a WordPress plugin. So it only works on posts/pages rendered via WordPress. I am wanting to use a lightbox to display a pop up on an adult site to warn visitors that the content is for over 18’s. The page I want to use it on is a page created outside the WordPress theme template and can only be accessed via the index.html file in my cpanel or via FTP. Is it possible to add this lightbox to such a page or is it only possible to use the shortcode to the WordPress editor? Im so excited , This is very awesome plugin.